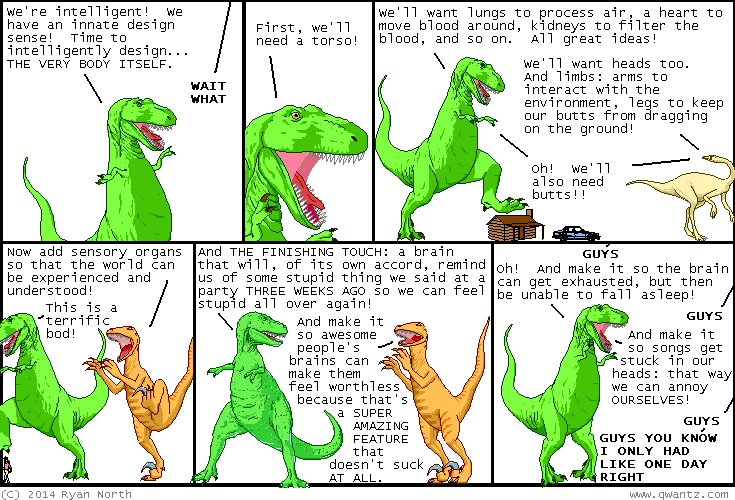 Dinosaur Comics - August 7th, 2014 - awesome fun times! August 7th, 2014: Dinosaur Comics has over a decade of comics for you to read! That's a lot of comics, and who wants to go back and read them all in one sitting? YOU? >Perhaps! And that option is available to you. But now there is another option: get a curated selection of Classic Favourites delivered to you every day! Dinosaur Comics is now syndicated on GoComics, and if you go to that site you can get new-to-you comics delivered right too you! ALSO: the comics are at a slightly higher resolution, which may blow your mind. ALSO: you can comment on the comics, which is something I've never had here, but now you can do it there! So it is time to share your opinions. One year ago today: this shock twist will be a complete surprise to everyone who knows english but none of the aphorisms contained within it! PERFECT.